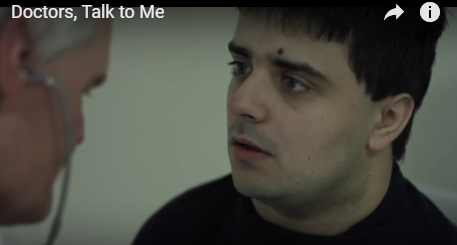 This film demonstrates how intimidating a doctors’ surgery, and especially a physical examination can be for someone with learning disabilities if medical professionals don’t explain what they’re doing and why. It can be used as a training tool and to improve practice by encouraging more explicit communication between healthcare professionals and children and young people. In the second part of the video, the doctor reassures the young man by explaining that the examination will go at his own pace, and that each step will be explained. The film was created by Fixers in association with Gurdesh Birdi and his team, who have learning disabilities and want doctors to talk to them, as opposed to their parents, in appointments.